As a drafting and design student, I have spent some time putting things in the “glass box”, and visualizing what they would look like in 2D in order to draw multi-view orthographics in 2D software. At the time that I was learning these techniques, I was completely new to drafting and found them to be easy enough concepts to grasp. 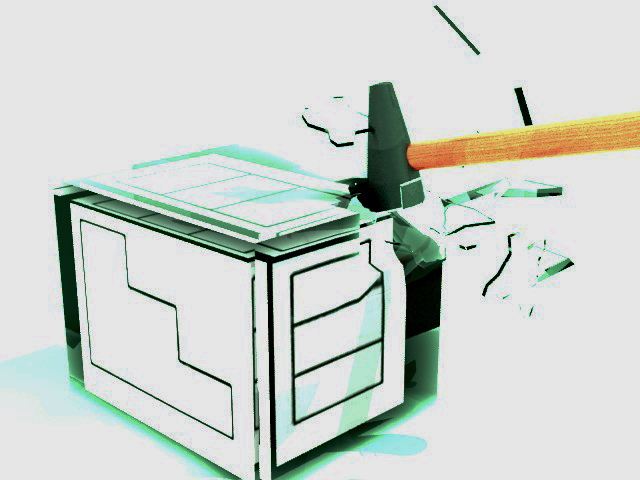 Once I started using SolidWorks and found the quickness and accuracy with which one could model an object and then create drawings, it became readily apparent to me that the time had come to smash the glass box! While I understand the need to learn the basic concepts involved in a trade, I feel like there needs to be a paradigm-shift similar to the one that finally regaled hand-drawing to a nostalgic past-time that is taught to first-month students and then put away. Much in the same way workstations with CADD software streamlined workflows and prevented costly mistakes, it is just a matter of time before it is the common practice to model your part and then derive your drawings from the model. It is already the best practice, and I feel that SolidWorks is the best tool for this job. I intend to expand on this idea and make Lost in Translation a reoccurring theme. I would like to hear from educators and students alike and get your take on this idea. Maybe more importantly, if they are any professionals out there that work for a company that has their drafters model a part as the basis for documentation, please share your thoughts on the practice. Ty Carrington is a drafting student at the Tennessee College of Applied Technology- Shelbyville, where he is also President of the school's chapter of SkillsUSA .